The Father and the Head of the Ukrainian Greek Catholic Church, His Beatitude Sviatoslav, sanctified on Sunday, December 2, 2018, the Cathedral of the Blessed Virgin of the Basilian Monastery in Bryukhovychi (Lviv). In his sermon to the faithful, the Head of the UGCC stressed the importance of believing and trusting God today. The spiritual leader of Ukrainians drew attention to how this week Ukraine was shocked by the great tsunami of distrust. “Even in the face of the great threat of a possible direct invasion of Ukraine, Ukrainians do not believe in anyone. Do not believe in the authorities or politicians. At times, they even doubt that we are able to protect our state. This total distrust starts to corrode from within all of us. It destroys human relationships. And I think that this biblical image of a bent woman is an image of a crooked Ukrainian distrust,” said His Beatitude Sviatoslav. “In the current waves of emigration flooding Europe, we conducted one of the studies that says that Ukrainians who went to Europe for work did not trust the Ukrainian embassies and each other. They do not trust even those who go to the same church with them every Sunday,” said the Head of the Church. Today, the Word of God calls us to open the door of trust to God with all our lives, even our infirmities, sins and illnesses. And then we will feel that the kingdom of God is between us. We have today seen the signs of the presence of the Kingdom of God here, between us, the consecration of the altar and of the temple, in which our monks and seminarians will pray. “We are well aware that it is impossible to learn something if you do not trust the teacher. Especially in the seminary, it is important that the seminarians trust their spiritual advisors. Then such a community can be so strong in mutual trust that it will overcome any difficulty. And this belief in God and trust in our fellow brother are necessary elements of education, growth in faith, spiritual progress, the teaching of theology, growth in the grace of God, as the Holy Gospel tells us,” said the Primate. “How it is important for us to be true, not closed, not hidden, not hypocritical towards God and our neighbor. 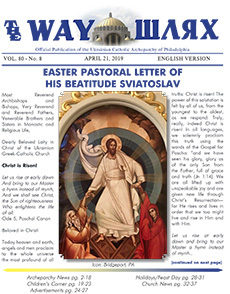 That’s what the freedom given by the risen Christ teaches us,” added His Beatitude Sviatoslav. The Head of the Church thanked all the sponsors who were engaged in the construction of the temple. The following Bishops took part in the celebrations: Bishop Ihor (Voznyak), Metropolitan of Lviv; Bishop Bohdan (Dzyurakh), Secretary of the Synod of Bishops of the UGCC; Bishop Iryney (Bilyk), Canonical of the Papal Basilica of Santa Maria Maggiore in Rome; Bishop Danyil (Kozlinsky), ruling Bishop of the Eparchy of the Veil of Our Lady from Argentina; Bishop Bohdan (Danylo), Eparch from Parma, US; Bishop Dmytro (Hryhorak), Eparch Buchatsky; Bishop Vasyl’ (Ivasyuk), Eparch of Kolomyia, Bishop Josafat (Hovera), Exarch Lutsky; Bishop Vasyl’ (Tuchapets’), exarch of Kharkiv; Bishop Mychailo (Bubnij), Exarch of Odesa, and Bishop Petro (Loza), auxiliary Bishop of the Sokal-Zhovkva. 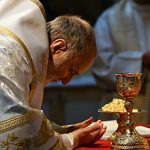 Finally, the Head of the UGCC presented Fr. Panteleimon Trofimov, provost of the cathedral, doctor of theology, rector of the Basilian Institute of Philosophical and Theological Studies named after Josyph Veliamyn Rutsky, with a copy of the Krylos Mother of God, which His Beatitude Sviatoslav had received during his last pilgrimage to Krylos.